The Patriots committed to the ground game for much of the first half and into the third quarter, but when the tough situations came up in the have-to-have-it third downs, Brady went to Julian Edelman and Rob Gronkowski. Both receivers made multiple critical first-down plays to keep the Patriots alive and send the Patriots back to the Super Bowl for the third straight year. The Patriots’ pass-rush baffled Kansas City all game, as they took the Chiefs to town with a variety of stunts and twists. Kyle Van Noy took full advantage of this disruption, recording a handful of pressures and knocking Patrick Mahomes to the turf on three occasions (two sacks and one hit). Rookie corner J.C. Jackson struggled quite a bit in coverage against the Chiefs – emphasized by two killer penalties on a Chiefs fourth-quarter scoring drive. Outside of Jackson, though, the Patriots got solid games in coverage from both Stephon Gilmore and Jason McCourty, who combined to break up a pair of passes while surrendering just one first down. The Patriots’ early game plan took away from the Chiefs’ greatest strength, the pass-rush. Both Justin Houston and Dee Ford couldn’t have impact games, partially because to the commitment to the ground game and partially due to Brady getting the ball out so quickly. When the time came late in the game to use their pass-rushing skills, they did not have the legs to create havoc in the pocket for Brady. The Chiefs’ best individual defensive efforts came from the interior defensive line led by Chris Jones and Xavier Williams. Jones made a positive impact in both the pass rush and in run defense, while Williams was a stout run stopper in the middle. Despite the Patriots’ commitment to the ground game, it was not as effective as it may have appeared. Damien Williams was the star of Kansas City’s offense in the AFC Championship game. 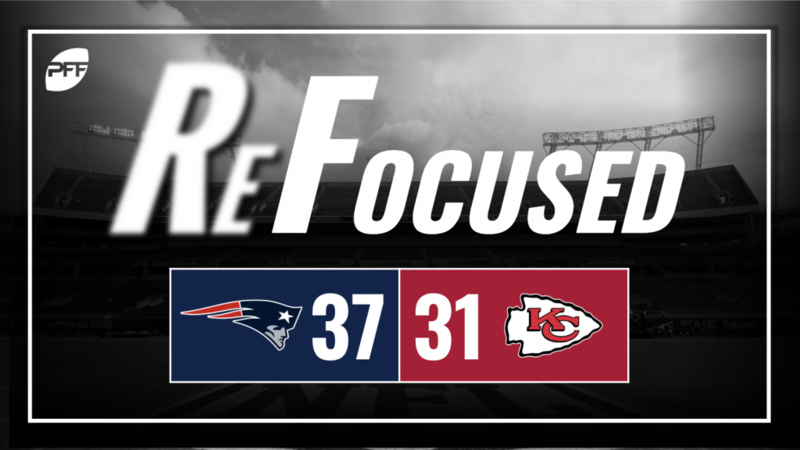 Williams compiled three total touchdowns for the Chiefs and could have had a fourth if Mahomes didn’t overthrow him on a wheel route on the Chiefs’ final drive of the first half. It was a bit of a roller coaster of a game for Mahomes. The MVP front-runner made some big-time throws and did a nice job keeping some plays alive with his feet and then connecting with his receivers on some scramble drill plays, but he was inconsistent throughout the evening when it came to his accuracy and was fortunate to fall on top of a fumble at the end of the first half that could have led to more New England points. Down late in the game, it was more of the same from the Patriots. Brady, Edelman and Gronkowski made game-saving third-down plays to keep the Patriots alive and eventually defeat the Chiefs in OT. Mahomes and the Chiefs’ offense did everything they could late in the game to give Kansas City a chance to win this game in overtime. Unfortunately for KC’s offense, they didn’t get a chance touch the ball once the game got into the extra period.